Think back to the first computer that your family owned or that you used in a lab at school. Did it have a dichromatic monitor, either black and white, or black and yellow-green? What kind of games did you play on it? 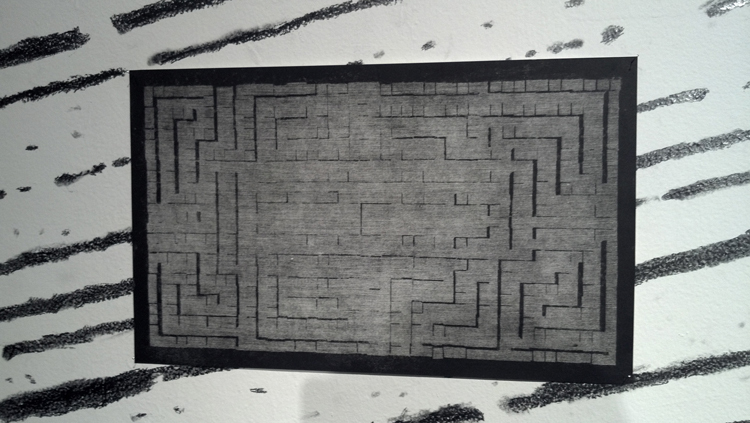 Did they involve mazes or other labyrinthine quests? For many of us, babies of the 1970s or 80s, the functional limitations of early computer graphics have manifested in nostalgia for antiquated digital art. The fondness applies whether looking back at artifacts from that golden era of PCs or creating new work that consciously employs, for example, pixilated forms and 8-bit sound. As articulated and aggregated by James Bridle, “The New Aesthetic” is a vast repository of source material for beginning to understand the ways in which people communicate with machines, as well as the way that machines have been taught to visually read the human world and communicate back. Reminiscence of cherished teenage videogames aside, the way that artists, architects, designers, programmers, corporations, and even government militaries are doing this is much more about looking forward than backward. In many cases the work that can be tagged under “New Aesthetic” is being done on digital-to-digital platforms—that is, creating on a computer something that will primarily exist and be viewed on another electronic device. However, there are also those who attempt to manifest physical representations of what may have only existed before in a virtual world. The technology as applied to fabrication can be incredibly advanced (think 3D printing), but it can also bring the process of making back to its mechanical basics. 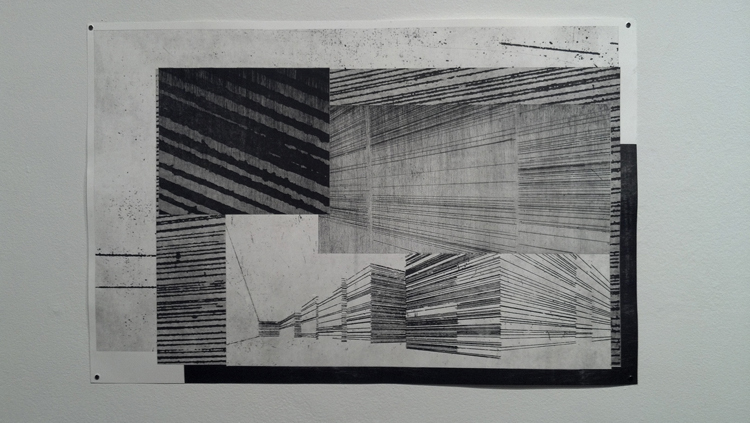 It is in this way that Ryan Parker renders his virtual worlds: with buren and acid on copperplate, then printed by intaglio press. Many of Parker’s etchings depict cityscapes of a sort, reminiscent of Renaissance “ideal city” paintings where the streets are desolate and the dramatic diagonals of perspective can swallow up a viewer. Whether one is a gamer or not, our twenty-first century ways of seeing have been so framed by computers that it is no great leap to imagine these views as a backdrop for urban commandos or apocalypse-survivors battling mutants. 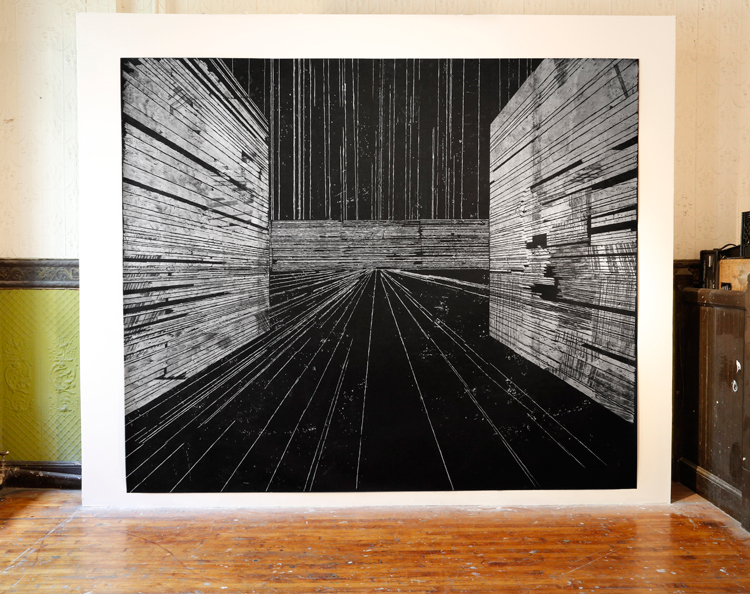 Parker’s outsized white on black drawing is large enough for visual immersion, allowing us to become the first-person shooter that is otherwise absent from all of the works. 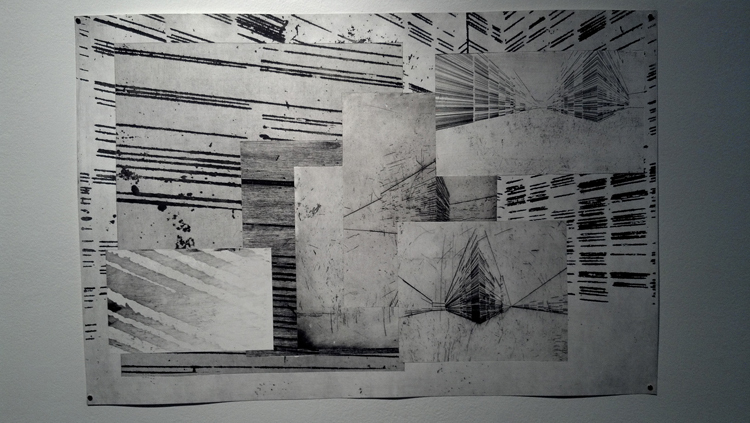 In a series of new pieces Parker has used collage, another analog technique, to imitate a digital phenomenon. 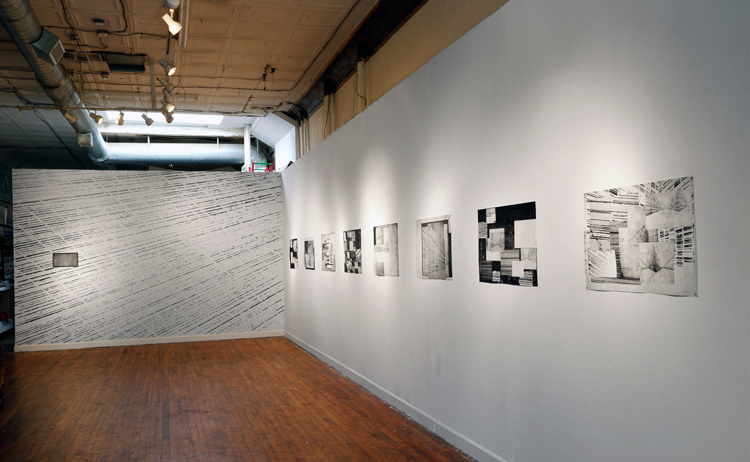 His method of cutting and overlaying several etchings of varied dimensions creates an effect like having multiple applications, the show’s namesake Finders, open on a computer desktop. The result is somewhat manic, not unlike attempting to toggle between too many open windows, whether at work or at play. Excel matrices might feel right at home in these worlds of gridded walls. That is, until we remember these forms are not, at their base, strings of code rendered by computer into something optically intelligible to a person; they are hand-drawn lines, inked grooves imprinted on to paper. This is where applying the “New Aesthetic” paradigm becomes twisty enough to make your brain hurt. What Parker and others like him have done is to make a physical version of something seen on a computer, which in itself was originally meant to imitate forms present in the physical world. His final product is a copy of a copy of some hypothetical original, removed from reality but authentic in its own way.